Caramel Corn Personalized Wedding Favors - Your guests will love our delicious Caramel Corn Wedding Favors & Caramel Corn Bridal Shower Favors! Our caramel corn is available in 3 delicious flavors, and is made with all natural ingredients, no preservatives! These make great favors for weddings, bridal showers and for the rehearsal dinner! We have 61 Wedding Favor and 23 Bridal Shower Favor package designs to choose from. View links to images below. 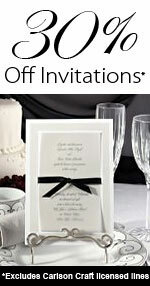 View All Wedding Favor Design Choices Available To Choose From then Click on Again. View All Bridal Shower Design Choices Available To Choose From then Click on Again. There is a required minimum order purchase of 24. If you are ordering a label design that you would like to have your photo put on, please email your photo to us at: sales@weddingsarefun.com. The photo should be at least 200 dpi or approximately 4 inches in size in a jpg, gif or tiff format. If you have any questions about personalizing or submitting a photo, please email us at: sales@weddingsarefun.com. Bridal Shower Favors, Beach Wedding, Baby Shower Favors, Birthday Favors, Anniversary Favors, Sweet 16 Favors and Graduation Favors, Girls Night Out Favors, Quinceanera Favors & Corporate Logo Favors. Package measures: 7 1/2 inches x 4 1/2 inches. Shelf life is 4 - 6 months.